Hand, clock, motel, scream, bird, body, river, stairs, hand. Latent = (of a quality or state) existing but not yet developed or manifest; hidden or concealed. “This exhibition features multipart photographic works by four contemporary artists: William Leavitt, Liza Ryan, Fazal Sheikh, and Whitney Hubbs. Juxtaposing images of people, places, and things, the works present fragmentary, enigmatic narratives that nonetheless establish a powerful, almost palpable atmosphere or mood. When sequenced by the artist in a specific order, the images recall storyboards used for motion pictures. When excerpted from a larger series, they suggest a stream-of-consciousness meditation on a theme. 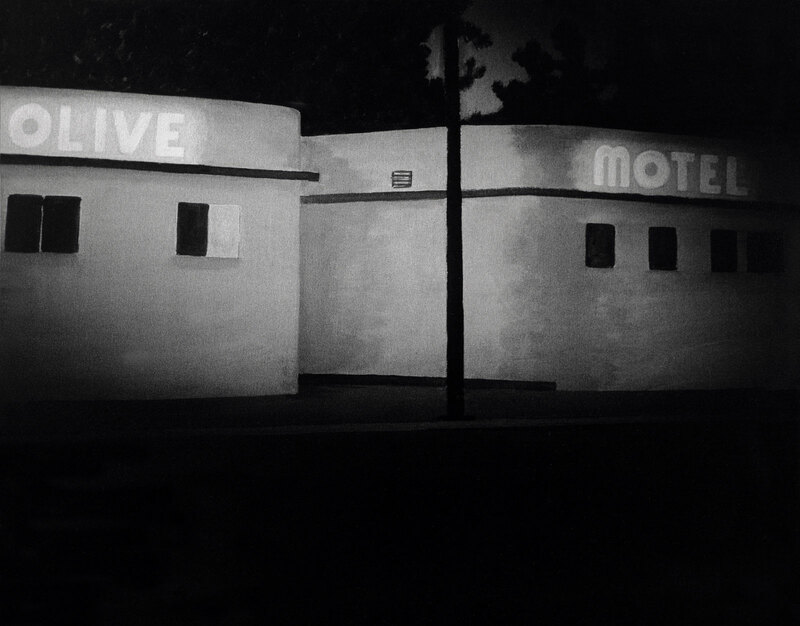 A painting of a motel in East Los Angeles. A primal scream. A funeral bier. 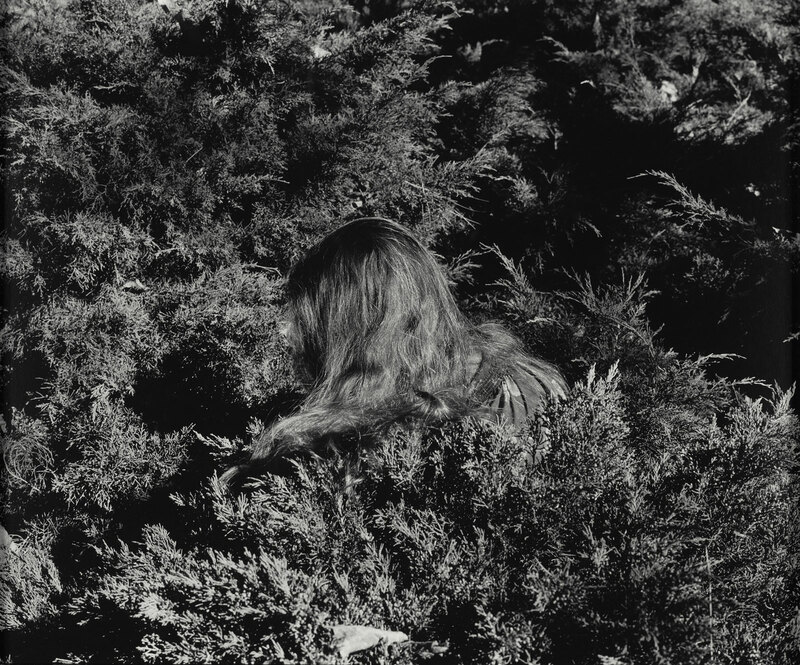 A woman crouching in a bed of shrubs. These ambiguous images are each components within larger photographic works that juxtapose images of people, places, and things to present fragmentary, enigmatic narratives. 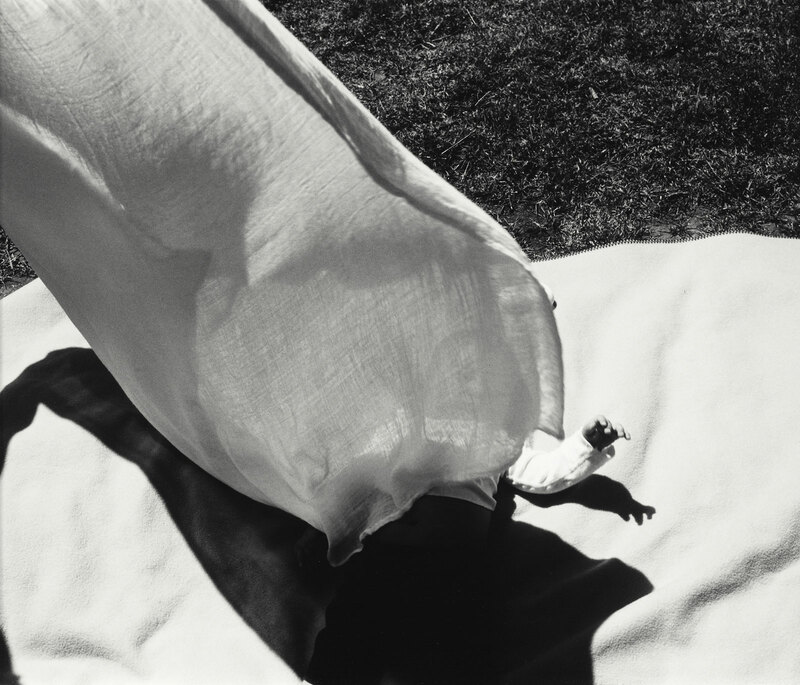 Recent Acquisitions in Focus: Latent Narratives, on view September 13, 2016 – January 29, 2017 at the J. Paul Getty Museum, Getty Center, presents works by contemporary artists William Leavitt (American, born 1941), Liza Ryan (American, born 1965), Fazal Sheikh (American, born 1964), and Whitney Hubbs (American, born 1977). By providing the visual cues or markers of stories still to be played out, the works in the exhibition establish a powerful atmosphere and mood, and encourage viewers to take part in completing the narrative. On view at the Getty Museum for the first time since acquired, many of the works in the exhibition were donated or purchased with funds provided by donors. Based in Los Angeles, Leavitt is closely tied to West Coast Conceptualism, and frequently references L.A.’s entertainment industry and vernacular culture in his work, which includes performance, installation, sculpture, painting, and photography. Spectral Analysis (1977) is a triptych of photographs based on his one-act play of the same name, which featured a man and woman in conversation within a set furnished with a starburst light fixture, a sofa, a side table with a portable television, and a long beige curtain into which a rainbow of color is projected. The four photographs of Innuendo (1995) depict the lobby of an apartment building, a painting of a fountain, a painting of a motel in East L.A., and a circular UFO-like construction made of PVC pipe. 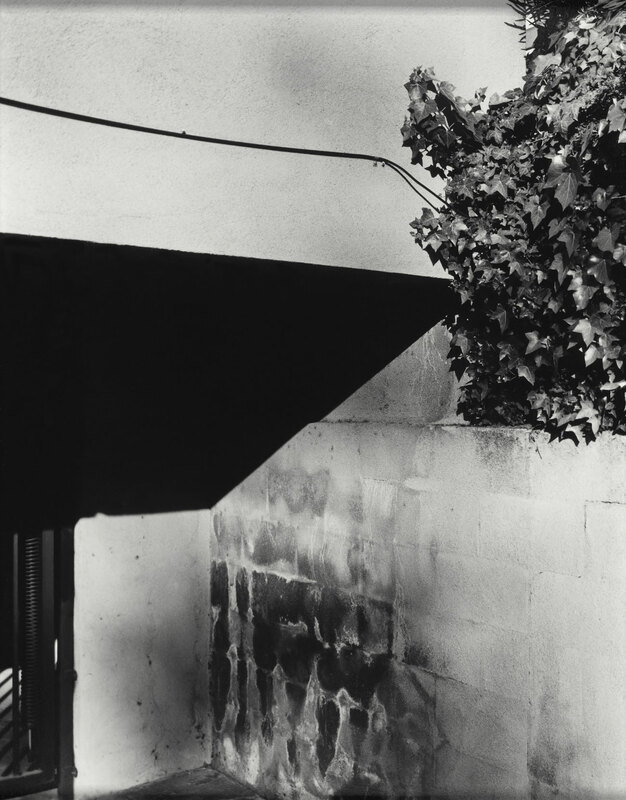 These images provide the loose structure of a narrative that moves unseen actors from one location to the next, suggesting the atmosphere of film noir. 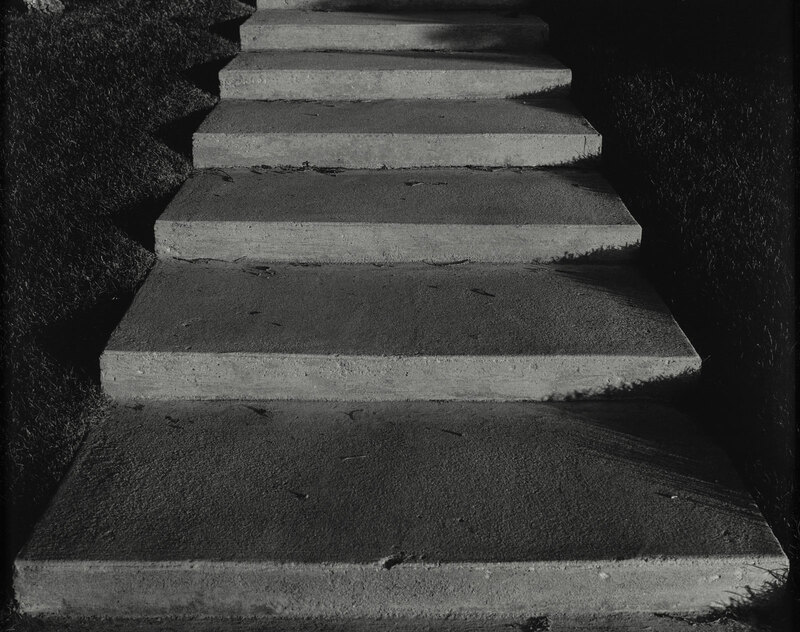 Working primarily in photography and video, Ryan often incorporates references from literature, poetry, and film to introduce additional layers of meaning. By cutting, collaging, and grouping her photographs and installing them in a manner that borrows from sculpture, she establishes evocative associative relationships between multiple images. Measuring thirty feet in length, Spill (2009) is a running band of cinematic narrative that alternates images of the human body and nature. Ryan poured India ink onto the surface of the prints, coaxing the pigment into a continuous, organic line that links the 23 frames as it wends its way from a primal scream at far left to an intimate touch at right. Fazal Sheikh is best-known for documenting displaced communities all over the world. 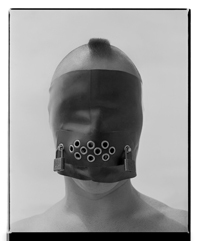 Executed in black and white with a large-format camera, his photographs typically portray the victims of human rights violations and social injustices, serving as a call to action. 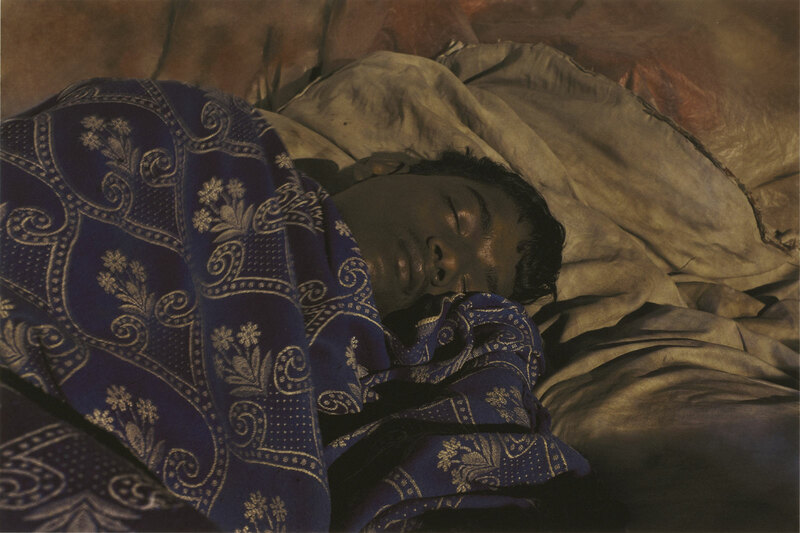 For the series Ether (2008-2011), Sheikh traveled to Varanasi (also known as Benares, Banaras, or Kashi), a city located on the banks of the Ganges River in northern India. Hindu pilgrims bring their deceased to this holy site for cremation, believing that the soul will ascend to heaven and be freed from the eternal cycle of reincarnation. Rendered in luminous, jewel-like tones, these photographs (his first images in color) highlight the vulnerability of subjects captured in the still of night or during early morning hours. Excerpted from the larger series, the four images presented – a sleeping man, sleeping dogs, a funeral bier, and burning embers – suggest the narrative progression of a pilgrimage. Collectively they can be seen as a meditation on the cyclical nature of life, as well as on the universal yet elusive experience of dreams. Hubbs’s installations of richly detailed gelatin silver prints in various sizes create lyrical but ambiguous juxtapositions. Citing music as an important influence, Hubbs is more interested in establishing a mood than in conveying a clear-cut narrative. 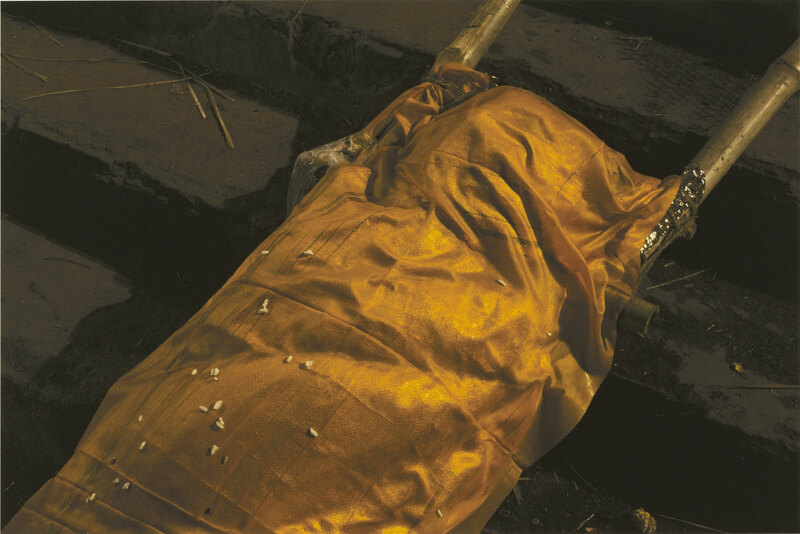 The five images in the exhibition – a rock formation, a building entry, a set of stairs, a woman crouching in a bed of shrubs, and a baby lying on a blanket – are taken from the series The Song Itself Is Already a Skip (2012). The title of the work was inspired by a passage of text by French philosopher Gilles Deleuze (1925-1995) that discusses the oscillation between order and chaos. The deep blacks of Hubbs’s meticulously printed photographs lend ominous overtones to her dreamlike imagery.